Spring is here! 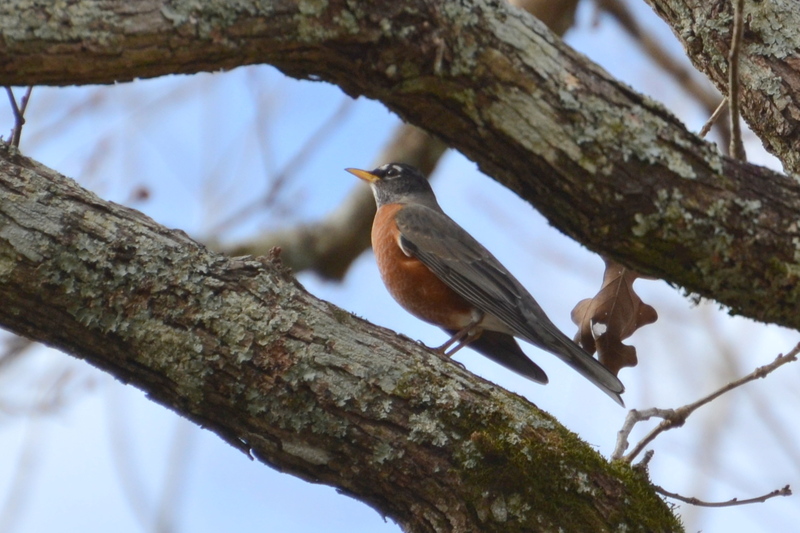 Around here, the trees are budding, the weather is alternately windy, stormy, and cold – and the birds are returning. Flocks of robins cover the neighbors’ lawns, and the ospreys have returned to claim and improve last year’s nesting sites. Bird migrations have long been a mystery to us simple humans. We’ve always noticed that the prevalent bird species in a given area change over the course of the year, and the flocking habits of some birds make it clear that some congregate and leave as a group. However, it’s not always been understood – Aristotle and his peers believed some birds roosted in caves all winter, in a sort of avian hibernation. And for centuries, all we knew was that birds left for the winter, but not where they went, how or why. One famous clue occurred in 1822, when a white stork was found in Germany, pierced by and still carrying an arrow made of African hardwood. This unfortunate Pfeilstorch (“arrow stork”) demonstrated that individual birds covered long distances during their annual migrations. These days, through tagging and other means, we know a lot more about global migration patterns. In some cases we can even track individuals. I know, for example, that the nesting pair of ospreys nearest my home just arrived from winter quarters Suriname and the Yucatan Peninsula in Mexico, respectively. But… how do they do it? Recent research is starting to solve the mysteries of bird navigation. It’s incredible, and it has to do with a family of protiens called Cryptochromes. Cryptochromes are common in many animals, and undergo specific chemical changes in the presence of light, particularly high energy light on the blue end of the visible spectrum. In most animals, the presence of cryptochromes and their associated reactions have been correlated to circadian rhythms – that is, these proteins are a primary sensor for “daylight” and the associated reactions drive our daily cycles of sleep and wakefulness. (As an aside, it’s also these reactions that let the blue light of computer screens mess up our sleep cycles at night). Birds have a different trick. We know birds can sense magnetic fields. This isn’t terribly unique, many animals can, through different means. In fact a study published last week suggests that even humans have an ability to detect magnetic field orientation, through an as-yet undetermined mechanism. In the case of birds, we’ve known for twenty years or so that their ability to orient seems dependent on the presence of blue light. One study on European Robins found that when deprived of this, and exposed to yellow light only, for example, they had trouble re-orienting. This is an interesting correlation, and an indication that cryptochromes might be in play. In further study, scientists noticed gene expression of a particular kind of cryptochrome protein that appear to be seasonal, instead of related to daily circadian rhythm. This protein becomes more prevalent in certain birds during spring and fall, and even more intriguing, it seems to build up in the birds’ eyes. In this particular molecule, high energy light causes the generation of a radical pair – a matched set of ionized (charged), reactive molecules. These pairs are unstable, but in the milliseconds before they recombine, their orientation changes in the presence of a magnetic field, and is particularly sensitive to field inclination, as opposed to strength. In short, these cryptochromes are biological magnetic sensors, and they are concentrated in the eyes of migratory birds. The conclusion – Birds can literally SEE the magnetic field lines of the Earth, and navigate using direct visual perception. Wow! What they see, exactly, might always be a mystery – our ability to comprehend different fields of view and different perception is limited by our own sensor systems and how our brains are wired. But we can guess – and the thought of just SEEING where the magnetic poles are is just fascinating. We can always learn more. I wonder, for example, how our electrical grids and the magnetic fields generated by local phenomena affect their perception. I wonder what powerlines look like? And, how does magnetic sensing combine with a visual mental map to provide enough precision to return to a specific nest year after year? Nature is incredible, and a reminder that we humans are still biological machines limited by our own ability to perceive. We have to remember that our intelligence doesn’t guarantee superiority in every way, and that we still have a lot to learn about the world we live in. Next time you watch a flock of birds, think about the fact that they’re pulling off a magic trick that we can only imagine. I’ll never look at a bunch of birds sitting on a power line the same way. They must know what it is they’re sitting on, on some level, and yet they do it anyway! Yeah I really wonder about how that must look. It apparently doesn’t matter much!